Share "Summer Tips For Your Pet"
We all love spending those long summer days outdoors with our pets. Let’s face it, they’re our furry companions and wherever we go, they go too. Keep in mind that like humans, not every pet can stand the heat. Where I come from down in Atlanta, Georgia during the summer, the mornings are hot, the nights are hotter, and the days are the hottest. With record summer temperatures occurring across the country, follow these tips to keep you and your pet safe, happy, and healthy. First, at the beginning of the summer take your pet for a check-up at the local veterinarian. Make sure your pet gets tested thoroughly for issues such as heartworm or other parasites that harm the health of your pet. Also if you haven’t done so already, consult with your vet and start a safe flea and tick control program. Summer brings more bugs and you don’t want these to bother your pet or your home. Second, when exercising your pet, do it early in the morning or late at night. Since the days are much cooler during these times, your pet will be much more comfortable running around and will have a more enjoyable outdoor experience. Given that the heat can be a bit intense, allow your pet a break from any vigorous exercise. You don’t want to exhaust your pet and cause its body to overheat. With all this exercise comes the need for a lot of hydration. 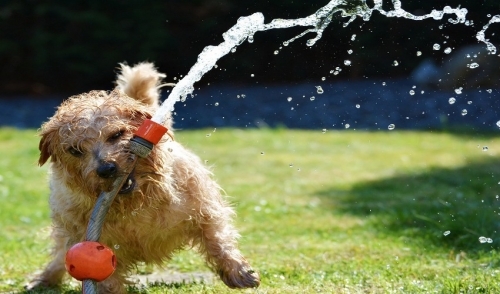 Pets can get dehydrated quickly when it’s hot outdoors because they can’t sweat. Dogs cool by panting, so if you witness your pet panting heavily or drooling, find some shade and give them plenty of fresh, and clean water. A pet that is not properly hydrated will become lethargic, and its eyes will turn bloodshot. To keep this from happening, always pack plenty of water and avoid being outside when it’s extremely hot. Also if your dog starts to get too hot, it will dig to avoid heat. So make a conscious effort to keep your pet cool by spraying its paws and stomach with cold water or giving it its own fan. Dog booties are another summer tip for your pet that you should take advantage of. I first came across these not too long ago and yes they are real. It may sound dumb, but as you and your pet are out taking on the world one park or trail at a time, imagine how much of it comes back into your home when your finished. This is especially for those individuals that sleep with their pets. Ask yourself; do you really want to know where those paws have been? In addition to cleanliness, doggie boots also offer protection from the heat when the days are extremely hot. Keep a clean house and protect your dogs’ feet by using doggie boots. Finally use the hot weather to go for a swim as often as possible. Chances are, your pet loves the water just as much as you do and it can take the place of a long sweaty walk. Try to always remember that if you feel it’s hot, then your pet feels the same way if not worse. Follow these helpful tips for your pet and both of you will have a great summer.